Thanks to Dr. Leow Wei Qiang, Singapore General Hospital (Singapore) for contributing this case and Dr. Belinda Lategan, St. Boniface Hospital (Winnipeg, Manitoba, Canada) for writing the discussion. To contribute a Case of the Week, follow the guidelines on our main Case of the Week page. (1) Feature of the Month - Scroll down on the Home Page. 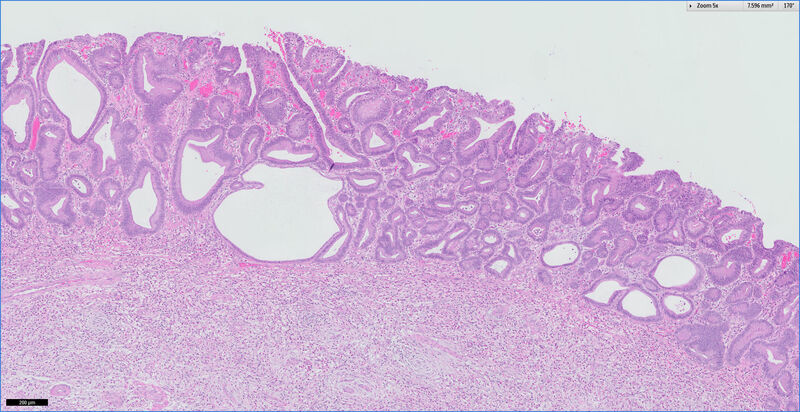 This month's feature may seem obvious to many, but some visitors do not know that we offer a Pathology textbook, which is accessed by scrolling down the Home Page. The chapters are arranged in alphabetical order, and offer ~7100 topics with text, images and references. If you own images of these entities, please email them as attachments to Dr. Nat Pernick at NatPernick@gmail.com, with any corresponding clinical history. There is no payment for image contributions, but we will acknowledge you as contributor, so please indicate how you want your name to be displayed. (3) We are working on making the Jobs page more useful to you. The table of contents now lists the total number of jobs in each location and by subspecialty, if 1 or more. 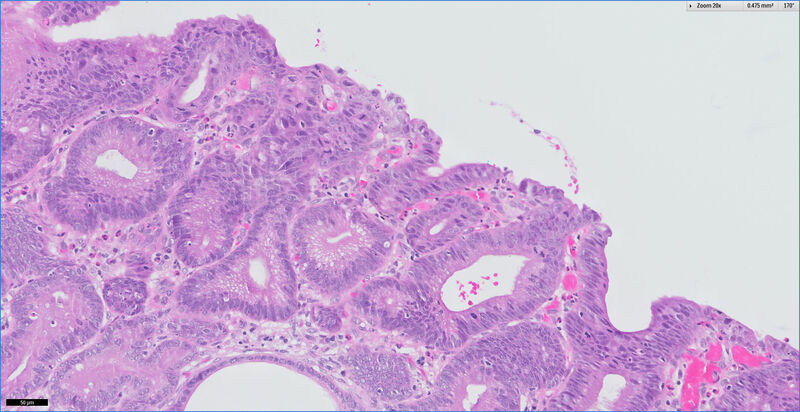 A 79 year old Chinese woman with a past history of chronic gastritis and associated intestinal metaplasia presented with weight loss. Esophago-gastro-duodenoscopy (OGD) revealed a 2 cm sessile gastric polyp in the greater curve of the antrum. The polyp was resected. The images show a polypoid mass expanding the submucosa. The polyp is composed of a loose fibromyxoid stroma with spindle cells that whorl around vessels, imparting the appearance of "onion-skinning". The mixed inflammatory infiltrate is rich in eosinophils. The mucosa overlying the inflammatory fibroid polyp demonstrates low grade dysplasia, characterized by epithelial cells with nuclear enlargement and hyperchromasia extending to the surface. Inflammatory fibroid polyp (IFP) is a rare benign tumor seen throughout the gastrointestinal tract. It is clinically called Vanek tumor and historically was called "gastric submucosal granuloma with eosinophilic infiltration". There is no definite gender predilection, and although more common in adults (mean age 60 years), may also be seen in children. It most commonly occur in the distal stomach (antrum, 60%) and terminal ileum (20%). Although often asymptomatic due to small size, submucosal location and sessile growth (<1.5 cm), larger inflammatory fibroid polyps may present as a mass with obstruction or result in intussusception (Radiographics 1999;19:539). Histologically, these polypoid submucosal masses contain a mixture of haphazardly arranged spindle and inflammatory cells, particularly eosinophils, in a background of prominent capillaries and fibromyxoid, granulation tissue-like stroma (Mod Path 2003;16:366). The spindled stromal cells typically whorl around vessels, resulting in an "onion skinning" appearance. There is no atypia, and no/rare mitotic figures. The spindle cells and blood vessels are immunoreactive for CD34, and negative for CD117, although mast cells are CD117+ (Mod Path 2000;13:1134). Staining for smooth muscle actin is variable. Excision is curative, as these tumors do not recur. Initially considered reactive, up to 95% of IFP have activating mutations in the platelet derived growth factor receptor alpha (PDGFRα), and are now viewed as PDGFRα driven benign neoplasms (Arch Pathol Lab Med 2011;135:1311). Although the histologic appearance of smaller lesions is considered characteristic, larger lesions may raise a differential diagnosis which includes inflammatory myofibroblastic tumor, gastrointestinal stromal tumor and inflammatory polyps seen in idiopathic chronic inflammatory bowel disease. 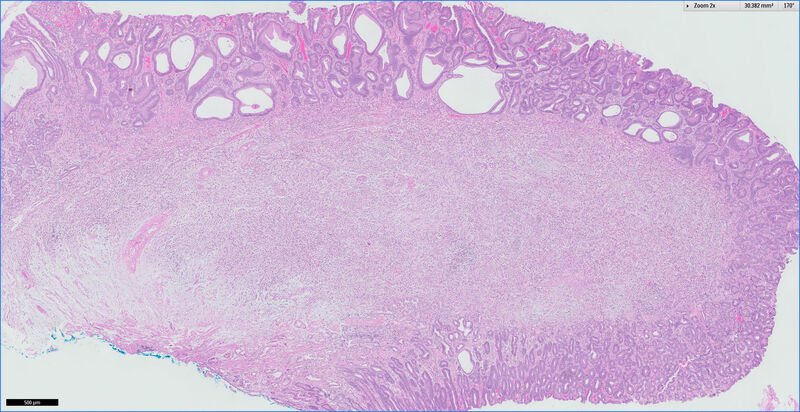 Findings in superficial mucosal biopsies may resemble eosinophilic gastroenteritis at first glance, although the presence of a mass lesion is not typical in this setting. Inflammatory myofibroblastic tumor, also called inflammatory pseudotumor, often occurs in children, where it is benign, but often recurs. These tumors, in general, are larger than inflammatory fibroid polyps, and the overlying mucosa may be ulcerated. They consist of spindle cells and an inflammatory infiltrate of plasma cells and lymphocytes, with few eosinophils. Cellular areas may have mitotic activity. The blood vessels are not as prominent as in inflammatory fibroid polyp. 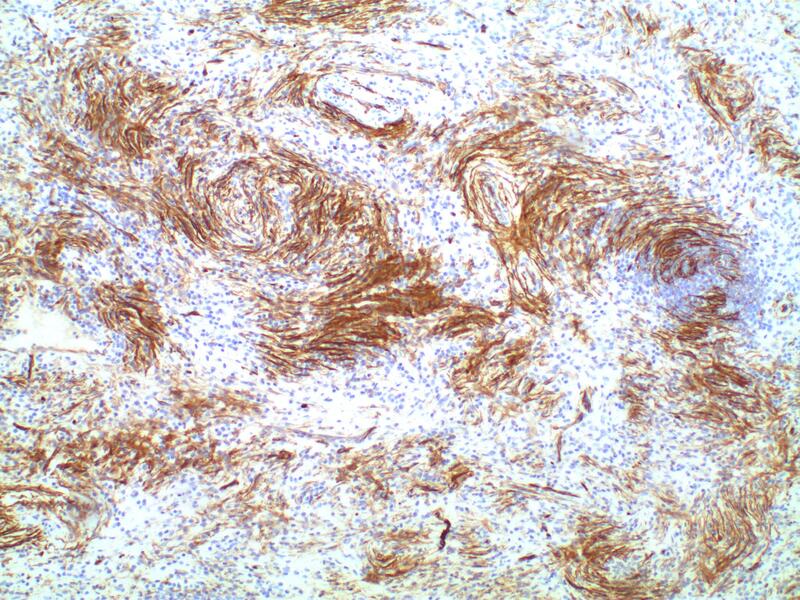 Inflammatory myofibroblastic tumor is immunoreactive for smooth muscle actin and desmin, with variable staining for ALK, and negative staining for CD34 (Hum Path 2002;33:307). 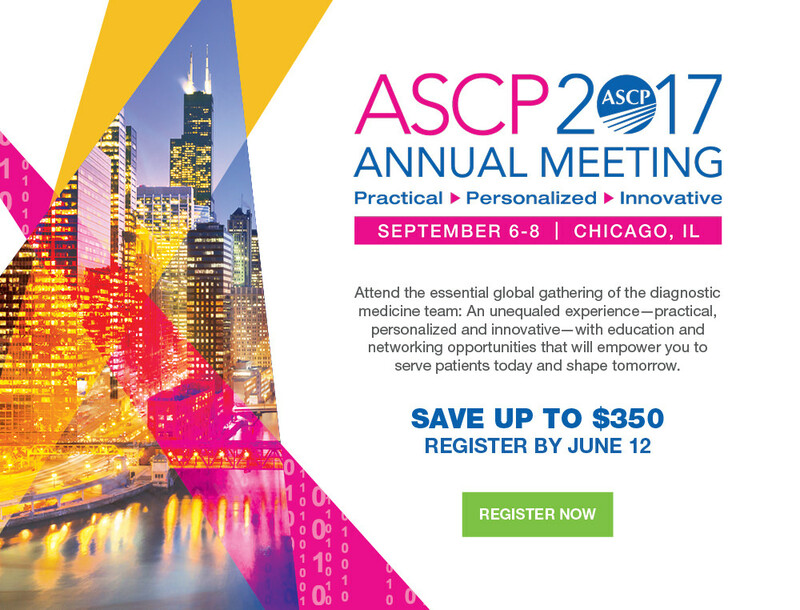 Gastrointestinal stromal tumors of the small intestine are malignant in 30-50% of cases, and have a 5 year survival of only 50%. 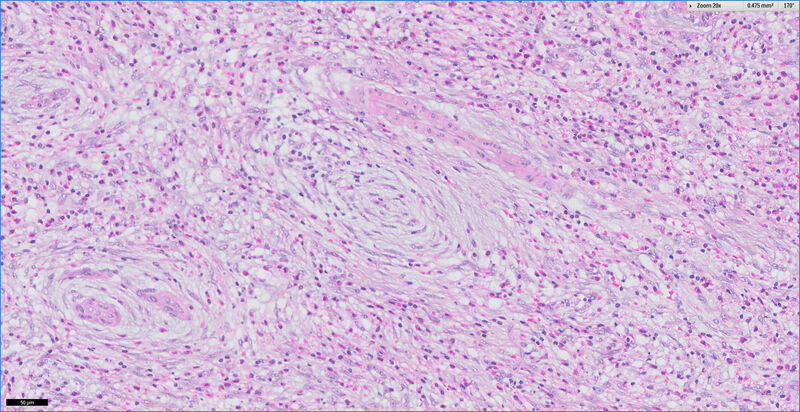 The histologically benign cases may have plump spindle cells with eosinophilic cytoplasm, skenoid fibers (extracellular collagen globules), and muscle infiltration. 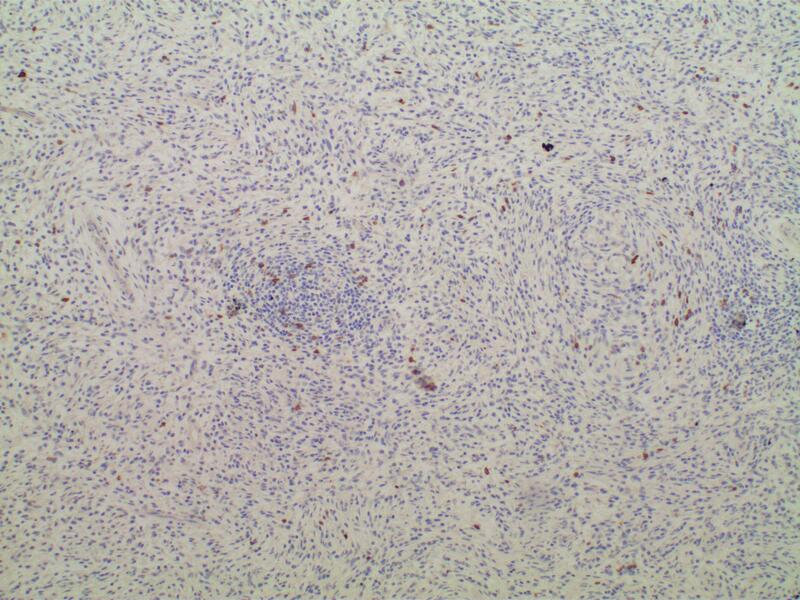 Most importantly, these tumors are immunoreactive for CD117, in contrast to inflammatory fibroid polyp. Rarely, inflammatory fibroid polyps may contain adenomatous or carcinomatous changes of the overlying gastric epithelium (Gastrointestinal and Liver Pathology: A Volume in the Series: Foundations in Diagnostic Pathology, 2nd Edition, page 131). A. Platelet-derived growth factor receptor alpha (PDGFRα).